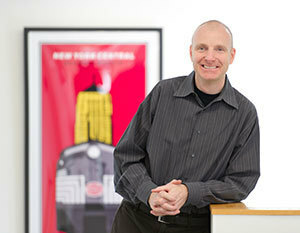 Robert Sedlack, associate professor of visual communication design in the Department of Art, Art History, and Design, is the recipient of the 2015 Rodney F. Ganey, Ph.D., Faculty Community-Based Research Award, given annually by the Notre Dame Center for Social Concerns. The award, in the amount of $5,000, honors a Notre Dame faculty member whose research has made a contribution in collaboration with local community organizations. Sedlack’s community building begins with the students in his Graphic Design 3: Design for Social Good class and expands outward to include community partners in South Bend, Indiana; South Africa; and Haiti. In 17 years at Notre Dame, he and his classes have worked on projects designed to address xenophobia and HIV/AIDS in South Africa, to give people in South Bend a more well-developed image of who the homeless are, and to change the impression that the Juvenile Justice Center makes on both offenders and their families. It is for the JJC project that he is this year’s recipient of the Ganey Research Award. “I didn’t get it,” says Morgan, who couldn’t figure out how design could improve the work of the JJC. And then Sedlack and his students met with Morgan and his staff and began to ask questions about the physical space, client communications, and how they used technology. Those meetings began to give those who work at the JJC a sense of how the building, letters, and signs were all communicating with those who entered the facility whether or not they knew it. “Everything they did surprised me,” says Morgan. He and his staff had noticed that juvenile offenders and their families often assumed a defensive attitude toward them from the time they walked through the doors. The staff understood their role as assisting juvenile offenders through a difficult period, educating them, and helping them onto a path that would lead back into society and in the direction of flourishing. Offenders and their families saw the JJC as only punitive. Sedlack and his students helped the JJC to see what in the building and communications such as court letters were conveying the message of punishment and obscuring the message of assistance. “They looked at the communications that we send out every day,” says Morgan, “and made us think about how somebody who receives this would feel, what would be their first impression. Starting there they helped us to rethink it entirely.” Soon the JJC staff and Sedlack’s students were generating various ideas about how to communicate the message that they are there for the good of the offenders and their families. They made a video explaining offenders’ rights and set up two monitors to play the video in the lobby of the JJC; they redesigned the logo and print materials of the JJC to communicate the idea that its purpose is to help offenders; and they repainted and stenciled meeting rooms to make severe, institutional spaces more warm and hospitable.